Features: The new Beltline parks not only know how to produce top quality playground equipment, but also use A LOT of playground equipment. Let me first address the splashpad. There are two areas to the splashpad, one where many of the jets come directly from the ground and one where the jets of water come from above. The area is quite large and many many many kids can play without becoming overwhelmed with each other. There are lots of benches for parents to sit so they can watch their little ones as well. And there are bathrooms! And FYI, the splashpad will close October 1st per the city of Atlanta Parks and Recreation Department. From the splashpad going north is the playground. This is a completely modern playground with tons of things I had to look up to learn the names. Approaching the area is a web like climbing structure with a trampoline like (although it’s not a trampoline, just looks like one) in the middle. It’s low to the ground and easy to climb and maneuver. Heading north are three large multi-person disc swings. There is a toddler climbing playground with a couple of slides, rock walls, and climbing structures. There is a little toddler acrobatic area where the kids can hang 3 feet off the ground instead of 6 feet off the ground (which my 2, almost 3 year old, loves!). There is a huge spinny merry go round. And finally there is the large play structure with all sorts of modern amenities. There are these stacking climbing triangles (called a triton), a modern slide (called an astrorail), several rope climbing areas including a web walk, some monkey bar type things (some with twisters, some with curved things), rock walls, several slides, and a music area. So much to do!! And then finally, the furthest thing north is the amphitheater. 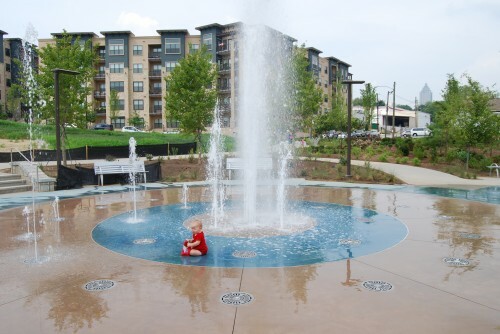 While there is no playground over here, it is a fun place for your kids to run around, climb on the steps, see a fountain, burn off some extra energy (in case they had any left after the splashpad and playground). This is actually a stormwater retention pond, which was one of the main things the city had to address with the building of this space. Surrounding Park Area: This area is ultimately going to become a 30-acre piece of greenspace that stretches roughly from North Avenue to Freedom Parkway. A separate area with a skate park (click here for review) is not currently connected but will be in the future. Construction is ongoing (as of August 2011), and there are bulldozers and dump trucks (which is another added bonus for some kids 🙂 ) working on the north side of the park. Shade: Well…in 30 years this playground will most definitely be a lot more shadier than it is currently. That being said, there are some baby trees that offer some tid bits of shade, but not a lot. Bring your sunscreen. Seating: Lots and lots of benches. And the benches that don’t get hot!! Safety: As with any playground, spotting your children is a must. Some of this playground equipment is definitely for a more advanced climber, so just be aware of your own kid’s ability. Cons: Is too much to do an acceptable answer?? Seriously, I can’t think of any. Maybe parking is a little tight. Overall Assessment: Amazing. Just amazing! I am proud to live in a city that is putting this much effort into their playgrounds. I am so excited for the Beltline to be complete, as I think it will really raise up the city in all kinds of ways. I also read on the Beltline website that this playground cost nearly $15 million less than the original estimate!! Seriously though, I can’t think of anything bad about this playground. You must check it out!! Great review! At the Historic Fourth Ward Park Conservancy, we couldn’t agree more. We are so proud of this wonderful, amenity-filled intown park. Please consider becoming a member of the Conservancy to help keep the park looking like it does and functioning to serve the community. Visit our website at http://www.h4wpc.org/membership. See you in the park! Definitely! In my opinion, this park is the best in Atlanta. Special thanks to everyone at the Historic Fourth Ward Park Conservancy for helping make such an amazing addition to our city!! Hope to see you around.